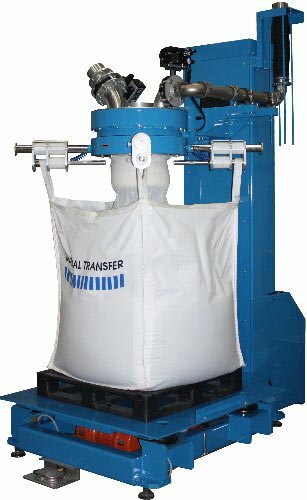 Bag inflation system includes air amplifier and a 4” diameter actuated butterfly valve for maximum bulk bag fill volume. 3” diameter dust take-off port with butterfly valve which vents displaced air to existing dust collection system. Fully adjustable, high output electric densification system settles product for enhanced stability. Inflatable USDA/FDA approved spout seal creates a dust-tight connection to the bag fill spout, actuated by ergonomic foot pedal for inflation and deflation. System includes a remote Allen-Bradley MicroLogix PLC with Allen-Bradley PanelView 1000 Plus color touch screen operator interface (not pictured).